Shadow: Registered name Jawa Peeps, Red Fawn male 50D—53538 5/11/10 80 LBS, 2 ½ years old. 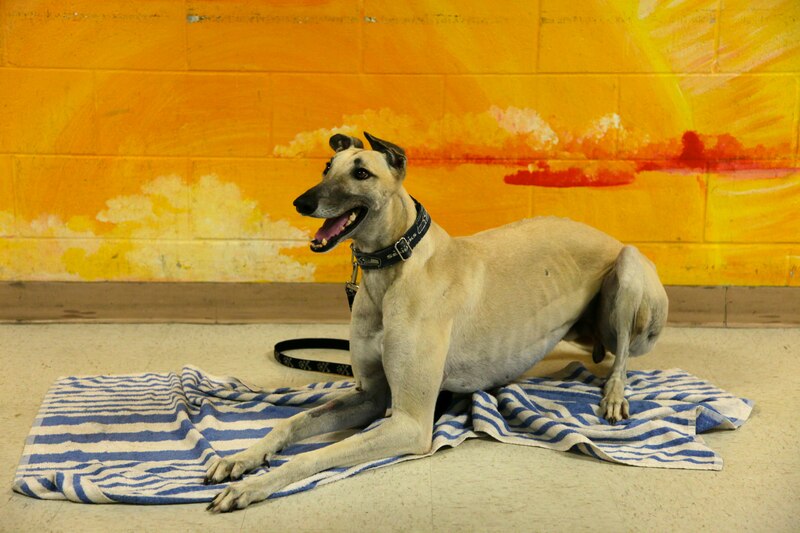 Shadow is a retired racing greyhound who is currently participating in the Greyhound Advancement Center Hardee Hero Hound greyhound and inmate prison training program at Hardee Correctional Institution. Shadow is a very loving, affectionate and friendly 3 year old greyhound. Shadow likes to show off his crazy ears. When Shadow is happy, he smiles. Shadow has a very loveable and fun-loving personality and will seek out affection from everyone. Shadow is highly intelligent, picks up on his commands quickly, has very good leash manners and gets along well with other dogs. Shadow has an even-keeled temperament and is tolerable of most anything. Shadow would be great with kids or even great if you do not have any kids. Shadow’s trainers at the track say he LOVES ice cream! Shadow will be graduating from the basic obedience training program and available to move into his forever home on December 6th. Tested cat friendly. Available through Gold Coast Greyhound Adoptions.